Most SDR's provide fairly good receive sensitivity, but the main factor that differentiates the performance is the Dynamic Range. This is a measure of how well you can receive very weak signals in the presence of other very strong signals. The two main parameters that define the dynamic range of an SDR are the number of bits used by the Analogue to Digital Convertor (ADC) and the sample rate and filtered bandwidth that the ADC is exposed to. If an SDR uses a high sampling rate but doesn't have an effective band pass filter ahead of the ADC, then any strong signals within the pass-band will contribute towards the overall signal level that the ADC has to digitise. So under some circumstances it's possible for an 8 bit RTL dongle with a 2 Mbit sample rate to out perform a 12 Bit device with a 65 Mbit sample rate but poor input filtering. This is simply because the 8 Bit dongle ADC is not exposed to as many signals within it's receive pass band as the 12 Bit device. 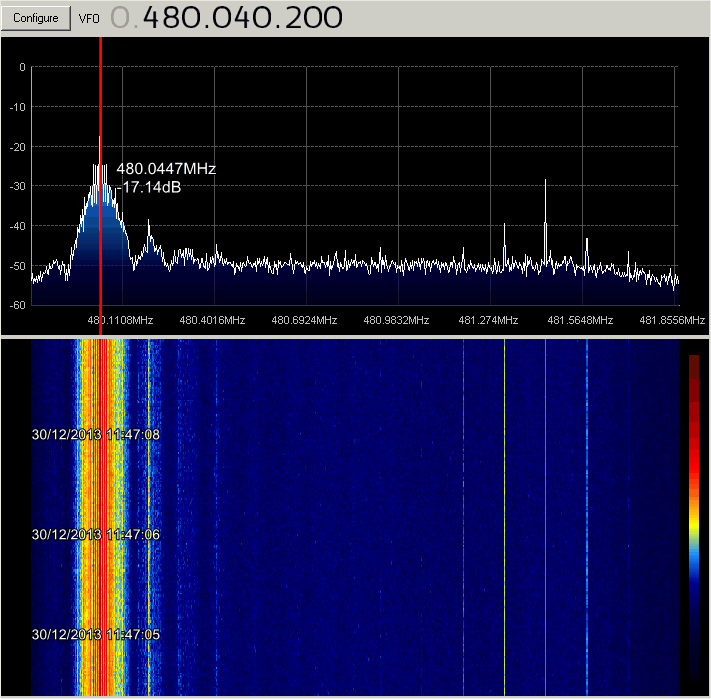 I run a 14 bit KiWi WEB SDR using a 65 Mbit sample rate ADC with a 30MHz LPF ahead of it. 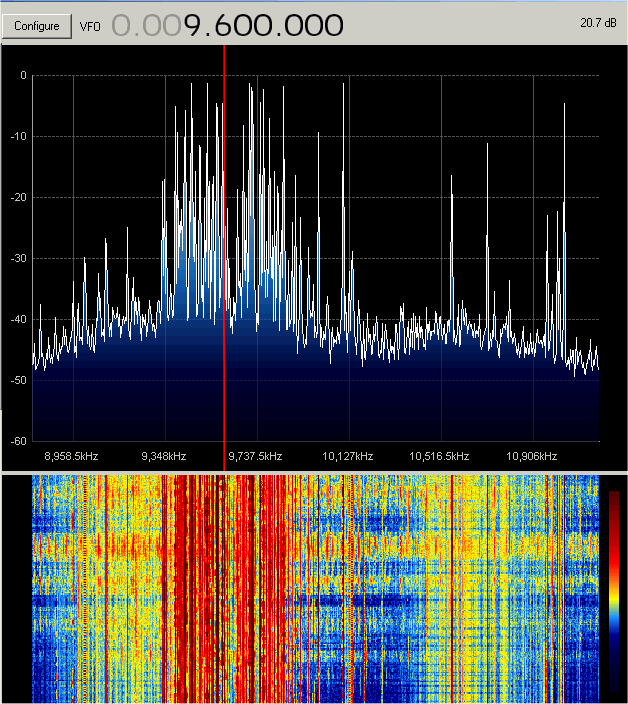 So although the SDR has quite a good dynamic range due to the 14 bit sampling, form time to time (especially at night) it tends to suffer from ADC overload due to very strong European Broadcast stations. I noticed that the problem was actually only due to a very few signals, which where considerably higher in level (>10dB) than most other stations within the DC-30MHz receive pass band. One or two other KiWi SDR's which are using good antennas (myself included) are also suffering from ADC overload due to strong Broadcast stations, so here's an inexpensive way to maximise the number of bits that are available for use by your SDR. 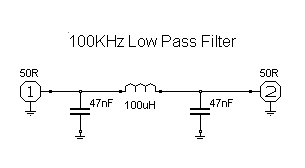 It's basically a very simple filter that introduces a very narrow 10dB deep notch on frequencies where there are problems with strong signals. A number of series tuned resonant circuits connected in parallel (shunt) with the KiWi SDR input. The frequencies and number of tuned circuits can be varied in order to suit your own RF environment. I chose to use four notches tuned to 900KHz, 5,900KHz, 7,400KHz and 9,400KHz, which corresponded to the strongest signals at my location. The following diagram shows the modeled circuit and frequency response curves. 22uH inductors are used in order to provide the desired bandwidth and attenuation for each frequency, but you can change the values as required. Almost any small mounded chokes will do, but I found it important to use mica or polystyrene capacitors. Small ceramic capacitors may work, but the 'Q' is often very low and they drift slightly in value with changes in temperature. Fixed value capacitors with trimmer capacitors connected in parallel were used to fine tune the circuits to the required frequencies. If you wish to obtain a deeper notch you just need to change the L/C ratio, or use two or more notches tuned to the same frequency. Design the filter for the notch depth that is needed to drop the signal levels below the required level. In the case of the lower frequencies it is usually easier to use a variable inductor and fixed value of capacitance, as this makes tuning of the circuit a lot easier. Old analogue AM radios are a good source of suitable variable inductors. If you can find one of the metal canned adjustable AM 455KHz IF transformers (remove the small capacitor that can usually be found in the base of the coil) or the AM local oscillator coil, these make great notch filters. Note that on the lower frequency bands in particular it is important to use good quality polystyrene capacitors in order to obtain the best notch depth. I built my filter into a small metal box with BNC connectors that simply fits in line with the antenna feed. Here are some plots of the actual filter response curves showing the notch depth and bandwidth. 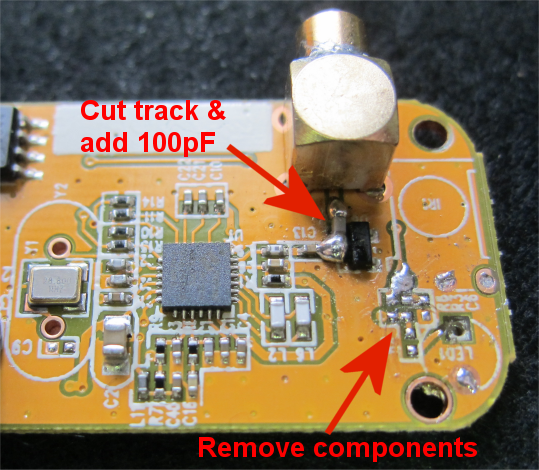 In July 2014, OH2FTG posted a video where he demonstrated how to use a RTL dongle as a low power transmitter, by extracting the Local Oscillator (LO) signal. Following this revelation, IK1XPV had a similar idea, and modified an RTL dongle in order to achieve a higher output level. Whilst discussing methods for testing antennas, I thought it would be useful if a RTL dongle could be used as a low power test transmitter, in order to perform antenna gain comparisions. 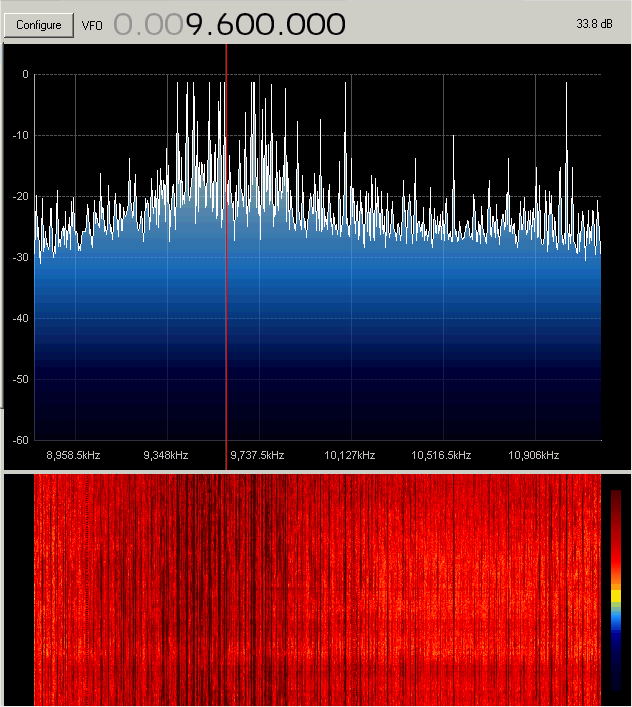 A quick check with a spectrum analyser showed that there was approximately -80dBm of LO leakage from the RF input connector of an unmodified dongle, which could be tuned over the frequency range 904MHz to 3544MHz. This is very useful as it includes the 1090MHz ADS-B, Inmarsat, GPS, 23cm, 13cm and 9cm Amateur bands amongst others. How to configure and tune a RTL 820T or RTL 820T2 dongle to produce an output signal using using SDR Sharp. 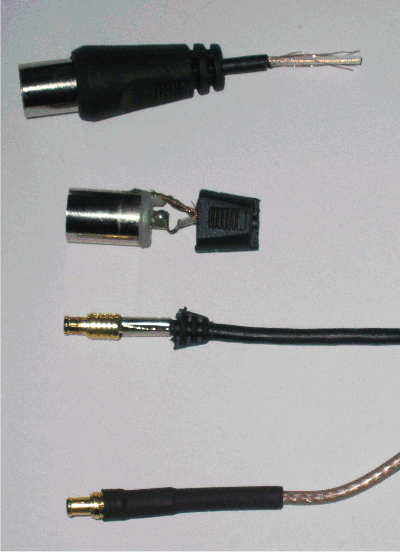 Connect the RF input of the spare dongle to a suitable test antenna such as a ½ wave dipole. 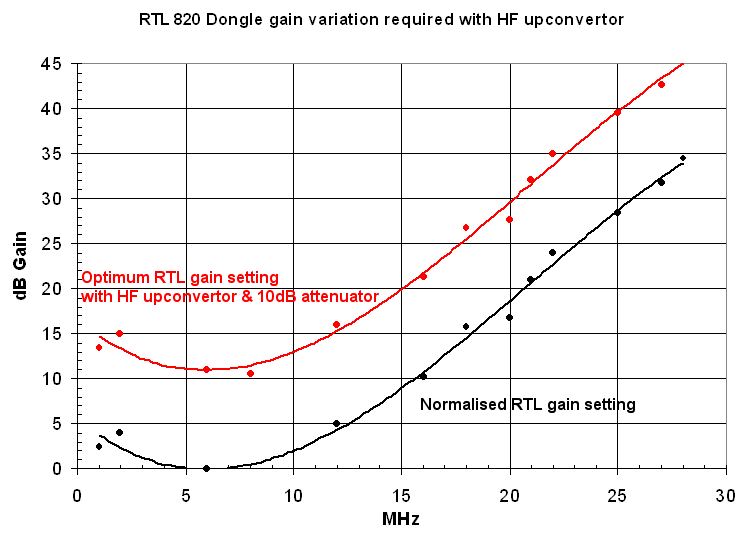 To produce an output near to 1090MHz tune SDR Sharp to either 268.93MHz for a plain vanilla RTL820 dongle or 266.5MHz for a RTL820T2 dongle (LO divided by four, minus the low first IF frequency which is usually either 3.57MHz for the 820T or 6MHz for the 820T2, (this depends on the exact tuning commands sent by SDR Sharp, which is why I suggest using the center tuning option). Add a cheap broadband amplifier if a higher output level is required. 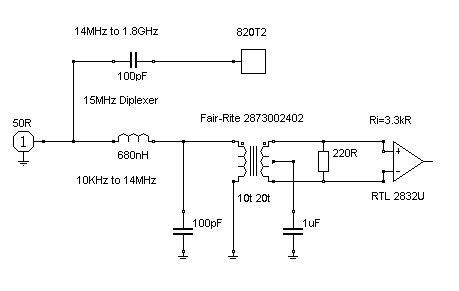 When the RTL820T2 dongle is used in direct sampling mode, it is capable of receiving signals on very low frequencies <1KHz (The modifications required to facilitate this are documented further down this page). 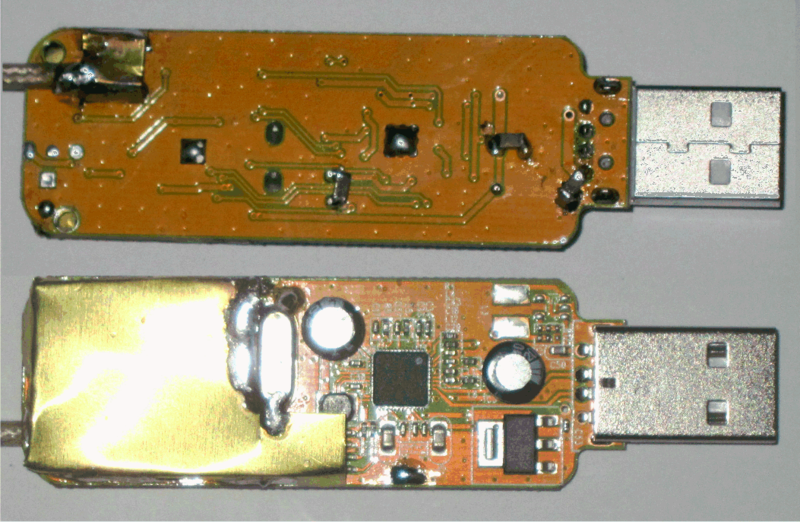 The following notes are a result of work I conducted for use on the SUWS WEB SDR in this application the dongle is used in conjunction with an active antenna using a pair of complimentary FETs. This was originally designed by Chris Trask and is documented on the Active antennas page of this website. In order to maximise the limited dynamic range of the RTL820-T2 dongle is was necessary to use an external frequency equalisation network. At the SUWS WEB SDR site, the two strongest signals are on 693 & 909 KHz, but it should be possible to get all three reduced to approximately the same level by careful adjustment of the centre frequency. 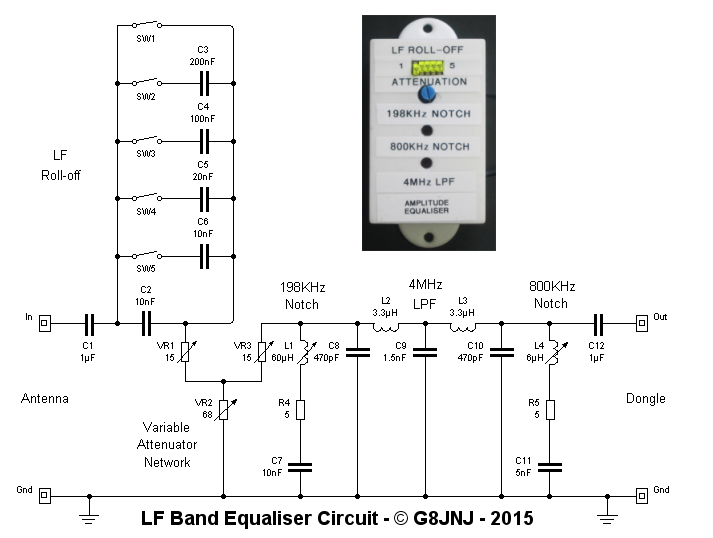 This is designed to provide various levels of LF roll off at the lowest frequencies. It is required because of the presence of very strong lightning pulses on frequencies around 10 KHz, which can overload the dongle and interfere with reception of the overall frequency range. As it is difficult to predict the performance of the antenna and dongle at a particular location, a series of switched capacitors can be used to set the best compromise between the performance on very low frequencies and the overall immunity to strong lightning pulses. The exact amount of roll-off is determined by the setting of 5 DIP switches, which select a number of different series capacitors that are roughly arranged in a binary sequence. The following table shows the switch positions and attenuation value measured at 10 KHz. Switch 1 is furthest to the left and switch 5 is furthest to the right. Note that Switch 1 completely by-passes the capacitor bank. Whilst trying to minimise the effect of lightning pulses it is also desirable to attempt to maximise the dynamic range on these very low frequencies. 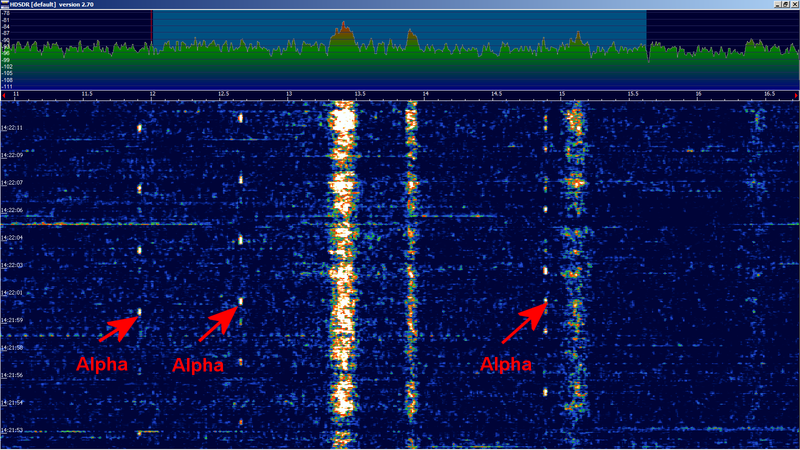 One such example is the series of weak Alpha navigation signals on frequencies around 12 and 14 KHz. 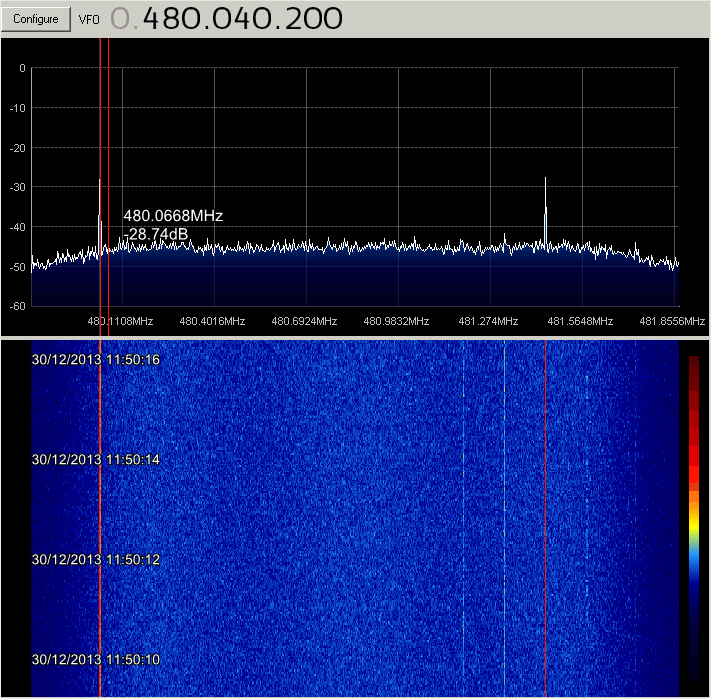 The 300 to 500 KHz aeronautical and maritime navigation band is a further example of weak signals that can be heard if the overall dynamic range of the dongle is optimised. 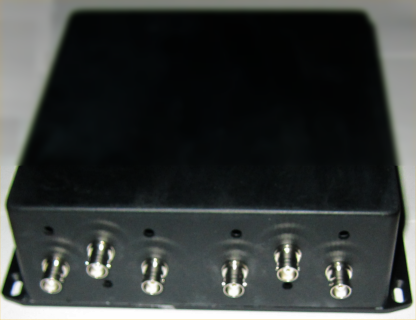 This modification adds a direct sampling and 15MHz diplexer to the existing input connector and provides frequency coverage from less than 1KHz to 1.8GHz. 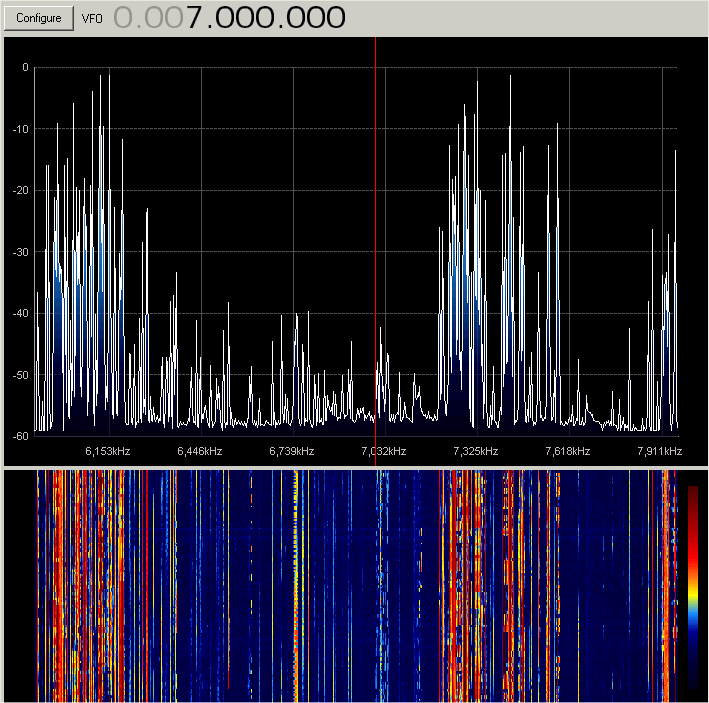 Note that HDSDR will not receive signals in its normal mode on frequencies below 24MHz, but by using a combination of direct sampling and normal modes it is possible to cover a very wide frequency range. In order to achieve full coverage, I would suggest using HDSDR in direct sampling mode to receive from 1KHz to 14MHz (good IF notch filters) and SDR Sharp to receive from 14MHz to 1800MHz (good scanning facilities). Circuit diagram showing new input diplexer and Balun transformer. The transformer core material I originally tested was type 73 ferrite with 10 trifilar turns, this gives fairly good performance over the required frequency range. 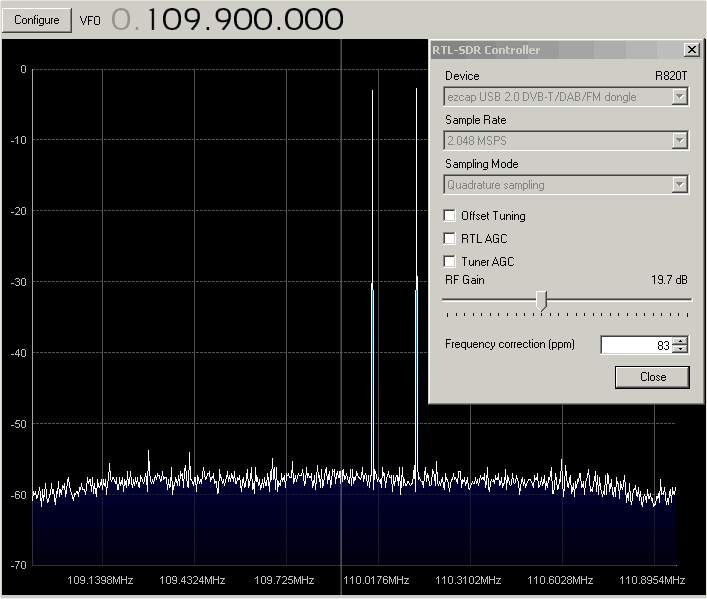 Type 43 ferrite material will also work, but RF levels below 100KHz are much lower (almost 20dB down at 18KHz). I've measured the input SWR of this circuit and it is less than 1.5:1. 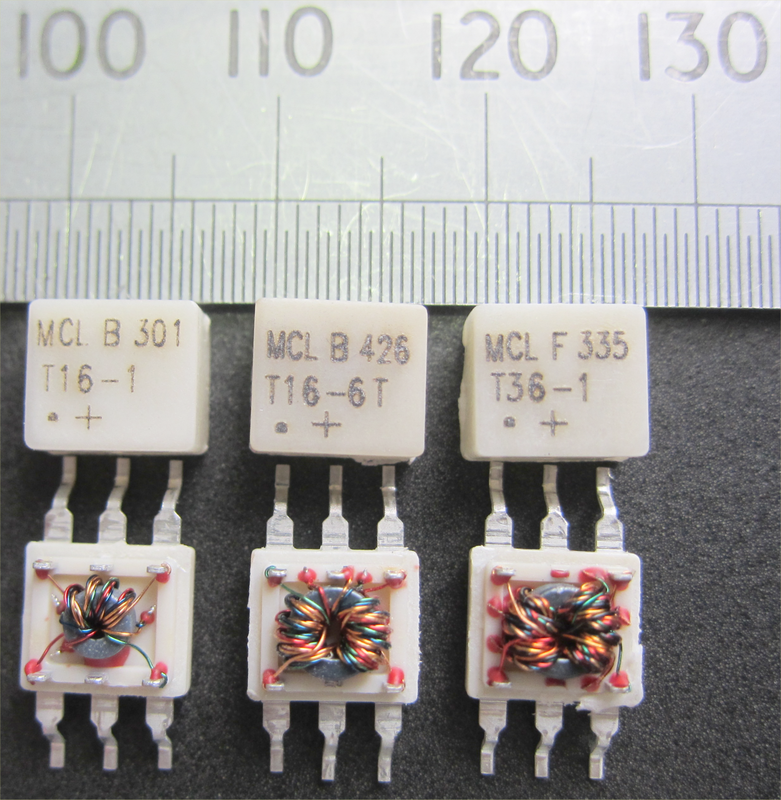 The differential input impedance of the RTL 283 chip is approximately 3,300 Ohms, so an additional 220 Ohm load resistor needs to be connected across the transformer secondary in order to provide the correct terminating impedance. I have tried other ratio transformers, but the 4:1 ratio transformer seems to give the best compromise between signal level, bandwidth and suppression of spurious signals. 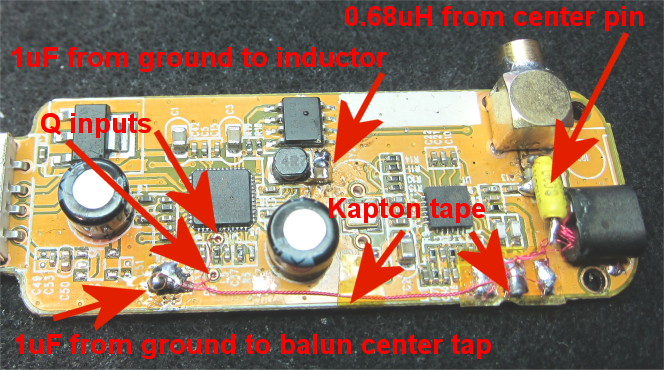 Note that I connected the Balun center tap to ground via a 1uF DC blocking capacitor, this seemed to further reduce some of the internally generated suprii and unwanted signals produced within the Dongle. The routing of the wires from the Q inputs to the chip back to the transformer is fairly critical in order to avoid noise pickup from the RTL 283 on-board DC-DC convertor. Running the thin balun wires close to the board (moving them around slightly whilst the dongle input is terminated with 50 ohms is a useful exercise). Covering the whole of the top side of the PCB with Kapton tape and placing self adhesive copper foil screening on top of the Kapton tape makes a further reduction in the level of unwanted signals. The component values for the diplexer are not quite correct, but they were the nearest values I had in the junk box. The HF port is fine but the LF port would benefit from a few more filter sections in order to further attenuate signals on frequencies above 14.4MHz. 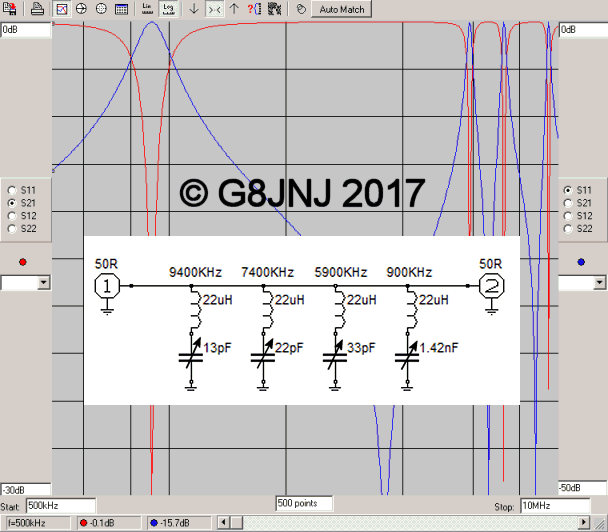 This is an alternative circuit that provides better rejection of unwanted images on the LF and HF bands. Note that I used standard value 100pF capacitors in order to make construction easier to implement on the PCB. The 1uF capacitor is a DC block that I have included as a safety precaution in order to prevent the inductors (which have a very low current rating) from becoming damaged in the event of the dongle input being incorrectly connected to the wrong side of the antenna bias tee. Track to IR detector circuit disconnected. If this is done carefully, it is possible to fit the PCB back into the original plastic case. Since originally publishing these notes, I have experimented with extending the LF range to cover even lower frequencies by increasing the number of turns on the transformer. 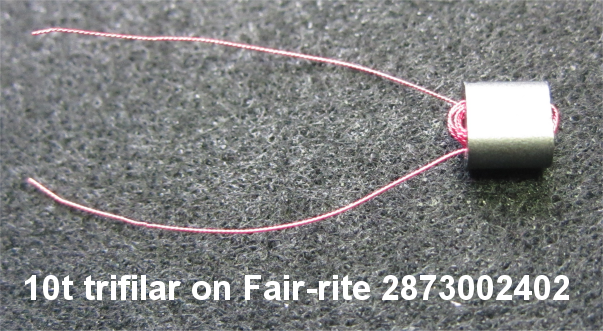 If you use fine enough wire (and have good enough eyesight) it is possible to thread more than 40 turns through the twin hole ferrite core. In practice I found that 30 turns provided the best compromise between good performance at very low frequencies and a flat frequency response up to and beyond 14MHz. 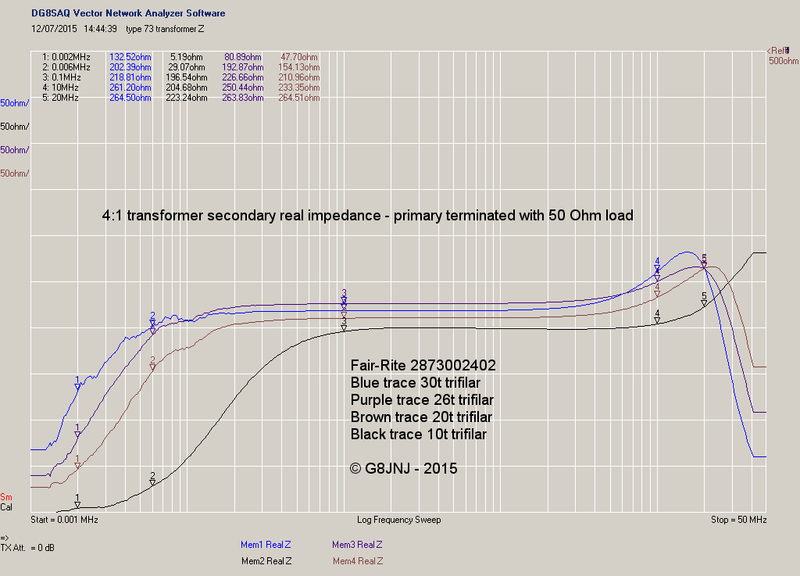 The graph below shows the secondary impedance of each transformer when the primary is terminated with a 50 Ohm resistive load. Note that even with 30 turns the high frequency performance is still adequate for most purposes and the overall frequency / amplitude response is good enough for measurement purposes. Another experimenter, Robert Symanek, wrote to me and described the results he had obtained. You are right about the RTL 2832 chip, the input impedance is very high, and most logic chips have a high input impedance. I found that Mini-Circuits makes a RF matching transformer (T16-6T-KK81, part number) that gives about 16db to 19DB higher signal that T37-43 toroid with 200 ohm on the secondary . The mini-Circuits RF matching transformer T16-6T-KK81 is fifty ohms on the primary and eight hundred ohms on the secondary. After reading Roberts notes, I managed (by means of an external resistive measuring bridge) to determine that the differential input impedance of the RTL 2832U device is approximately 3,300 Ohms (3K3) when the input is enabled. I had previously found that even with a 4:1 ratio transformer, the input signal level is plenty high enough for my purposes. But in order to improve the input match and amplitude / frequency response, I have now modified my circuit to include a 220 Ohm terminating resistor across the transformer secondary, This has not decreased the signal level by any significant amount, and the RX S/N ratio has remained the same. I think it would be very difficult to build a 66:1 ratio transformer with sufficient bandwidth for this application, But based on my experiences, I believe that Roberts choice of a T16-6T-KK81 transformer is a good one, but I'd suggest adding a 1K terminating resistor across the secondary (in parallel with the 3K3 input Z = 800 Ohms) in order to provide a flatter frequency response and better input match with no 'peculiar' self-resonant peaks & dips. Whilst looking at the Mini-Circuits catalogue, I also came across another transformer with a higher value of impedance transformation ratio, part number T36-1-KK81 which offers a 36:1 ratio over a frequency range of 30KHz to 20MHz. This would provide a higher input voltage, but as before Id strongly suggest connecting a 3,900 Ohm (3K9) terminating resistor across the secondary. This is in parallel with the RTL 8232U input impedance of 3,300Ohm (3K3) so the secondary of the transformer is correctly terminated with a 1,800 Ohm (1K8) load impedance. Note that the T36-1 and T16-1 transformers do not have a centre tap on the secondary, so the 1uF capacitor shown in my original modification can be omitted. Robert very kindly sent me some samples of the Mini-Circuits transformers to test. I connected each transformer in turn to a 820T dongle and measured the signal level and frequency response of each type. The results are shown in the following table and graph. The T16:1 and T16-6 provide a terminated level which is approx 7dB greater than the 4:1 ratio transformer. The T36:1 provides a terminated level which is approx 11dB greater than the 4:1 ratio transformer. 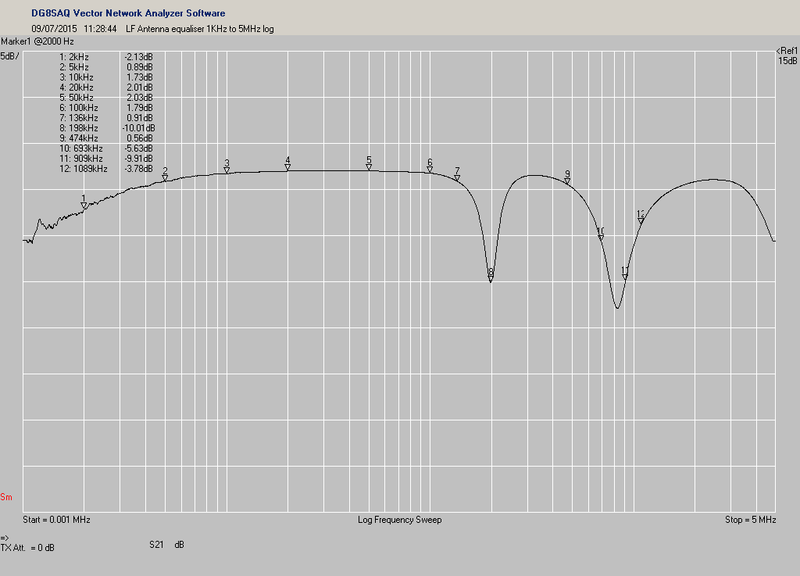 As expected the upper frequency limit falls away much faster as the transformer ratio becomes larger. In all cases the signal level was a few dB higher when the transformer secondary was not terminated, but the overall frequency response was not as flat, and a much greater variation in signal amplitude occurred across the desired frequency range, especially when using the higher ratio transformers. This variation would be much more noticeable when connected to a typical antenna as it would not present a purely resistive 50 Ohm source impedance. The 4:1 ratio offers good performance at really low frequencies, with a very flat frequency response over the whole range, but at a lower signal level. The 16:1 offers good signal levels over most of the useful operating range especially on frequencies above 100 KHz. The 16:6 offers offers good performance at low frequencies and a flat frequency response with good signal levels over the useful operating range. The 36:1 offers moderate performance at low frequencies, with a compromised high frequency performance, but a much higher overall signal level. Based on these measurements I would concur with Robert's findings, that if you don't wish to wind your own transformer, then in the majority of cases the Mini-Circuits T16-6 Transformer offers the best compromise between overall frequency coverage and signal level. 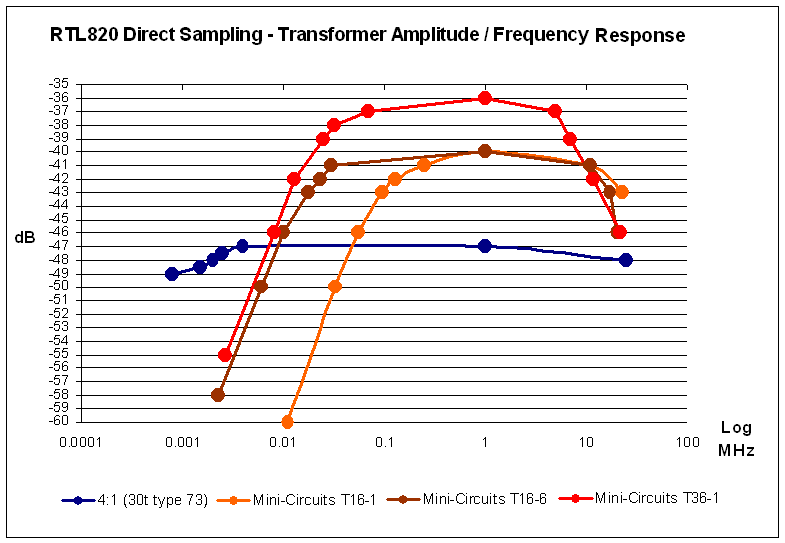 I was slightly surprised to find that the 36-1 and T16-6 Mini-Circuits transformers had better performance at the low frequency end of the operating range in comparision to the T16-1 version. So I carefully opened up one of each type in order to see what was causing the difference. The type T36-1 and T16-6 use larger ferrite cores and more turns of wire than the T16-1, which is why they have enhanced low frequency performance. One other option, as an alternative to using a transformer, would be to build a buffer amplifier with a differential output. Texas Instruments produce a range of low noise, high slew rate, differential input/differential output devices such as the THS4151, which look ideal for this purpose. 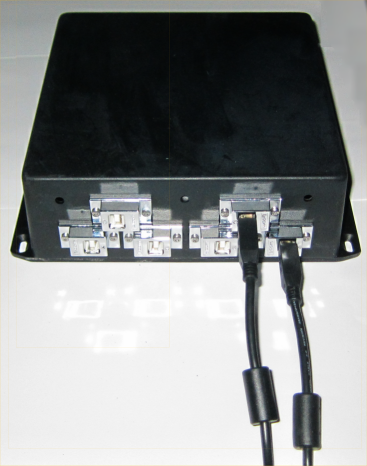 This application is supplied with SDR Sharp, and is required to load relacment drivers. Connect the RTL dongle to your PC. Do not run any drivers that may have been supplied with the dongle, and cancel any automatic windows driver install routine. Identify the device name allocated to the RTL dongle by opening device manager and checking for new USB devices. You may need to plug and unplug the dongle to identify which USB device is the correct one. Locate Zadig.exe in the SDR Sharp folder and run. Select the correct USB device in the Zadig application. If you wish to, you can change the name of the device in order to make it easier to identify in future. Finally run Zadig to install the replacement windows driver. Frequencies between DC and 28MHz can now be received using direct sampling. However due to aliasing of the 28.8MHz clock sampling frequency, some image frequencies from above 14.4MHz are present below this frequency and some frequencies from below 14.4MHz are present above this frequency, but these are generally not problematic. This can improve sensitivity in the VLF frequency range by attenuating strong MF broadcast signals. Ive recently bought quite a few RTL DVB-T RTL 2832U / Rafael Micro R820T dongles to use for various purposes. Whilst experimenting with these devices, Ive noticed that one or two have much higher levels of internally generated unwanted signals and broadband noise than the others. 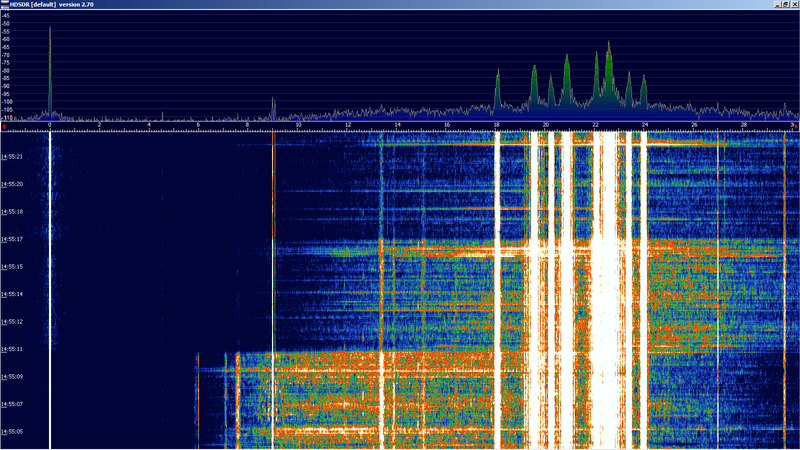 Prodding around with a spectrum analyser Ive found that there are three main sources of internally generated noise. Plus received noise on the connecting cables which can be from any of the above, or external sources. Looking first at the three internally generated noises. The 28MHz oscillator is a fairly integral part of the design, so theres not a lot that can be done to reduce these signals. Soldering the oval shaped metal can of the crystal to the PCB ground plane can reduce the level of some harmonics slightly, but I found that any improvement was hardly noticeable. Wideband noise with spurs from the USB data lines and the on board 3.3v to 1.2v DC-DC convertor could be dramatically reduced by adding some metal screening around the RF input stage. I used some very thin brass sheet that I obtained from a model shop for this purpose, but some metal from a tin can would work just as well. I found that this was easier to implement if I removed the IR receiver, blue LED and associated surface mount resistors from the top side of the board. Adding a small patch of metal across the underside of the RF connector pins on the reverse side of the PCB also made a big difference. Note that placing the whole dongle inside a tin can didn't seem to help. The noise seems to be coupled directly between components on the topside of the PCB. I decided to try fitting 0.1uF chip caps across all the main electrolytic capacitors and DC rails. None of these seemed to make much of a difference to the remaining spurious signals that could be observed with the antenna disconnected, but I thought it was worth adding them for the sake of completeness. If these modifications are done carefully, the plastic case will snap back on without any problems. All of these modifications made a significant reduction of unwanted signals. 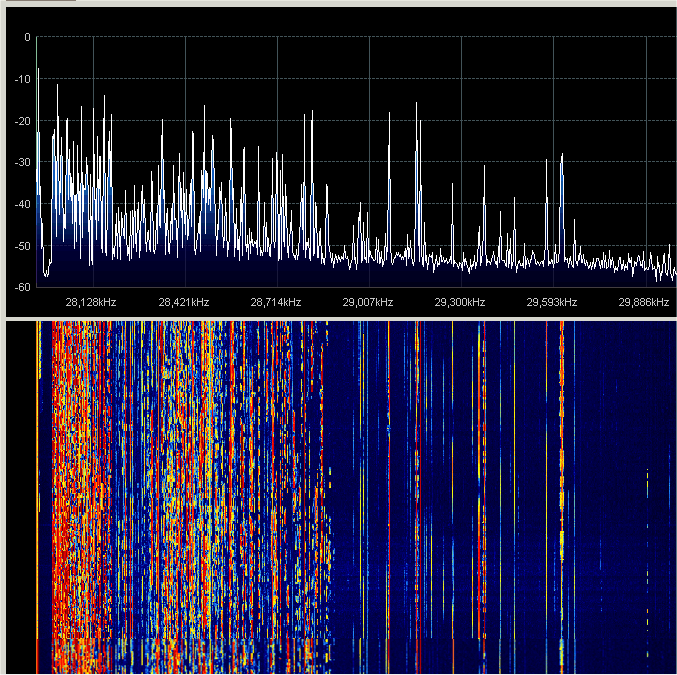 The next two photos show the before and after unwanted signal levels at around 480MHz. 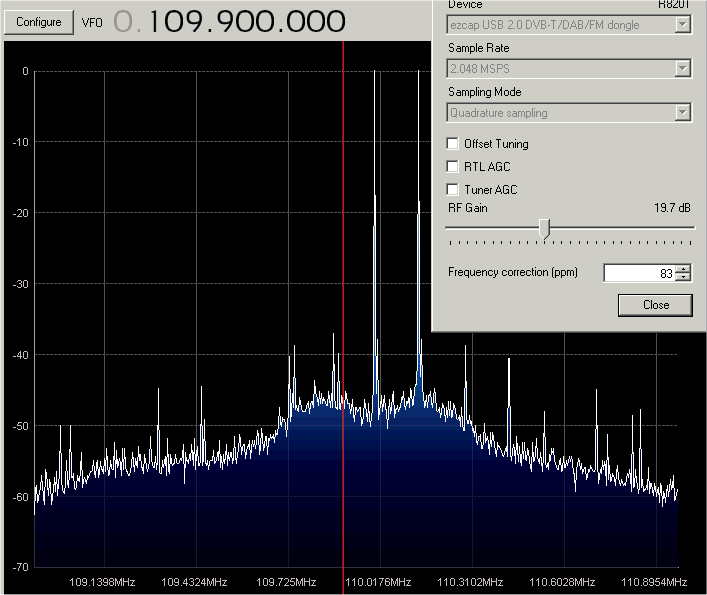 Note that these signal levels were with the dongle set for the maximum RF gain of 42dB. When used at a more reasonable gain setting of 30dB, all unwanted signals (with the exception of harmonics of the crystal oscillator) were usually at a level near or below the dongle noise floor. I also noticed that the 820 sticks have got a back to back SMD package strapped directly across the RF input. It may be worth checking to see if that has got popped by static if you have a broken one. Once I had sorted out the internal noise sources I took a look at what external factors could be causing problems. I noticed that when I connected the short RF fly-lead that was supplied with the dongle to the input, a lot of noises Id just got rid of had returned. These were not detectable when the input RF cable was removed. The main problem was the poorly screened fly-lead. Unfortunately the connector is a male MCX, which I didn't have in my junk box. So in the end I just ran a small length of thin PTFE 50 ohm coax with good screening from the rear of the connector to a BNC plug. A quick melt of the plastic case and the cable exits OK, and the case will fit back together again.Fortunately this solved the problem almost completely. 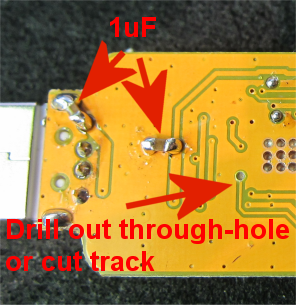 I decided to cut up one of the dongle fly-leads in order to see if I could figure out why it was so problematic. As soon as I stripped back the coax and plastic moldings it was obvious that there was hardly any copper in the non-overlapped screen, and a very poor termination at the TV connector end. Fortunately it's easy to take apart the crimped connector at the MCX end and fit to some proper PTFE coax. So this is what Ive now done rather than wire directly to the board. 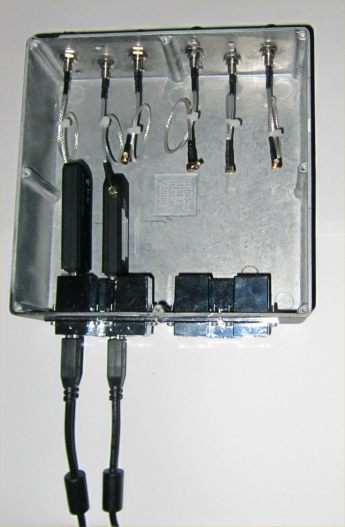 In order to further improve the dongle screening and make them more robust. I made up this de-cast metal box for use on our WEB SDR. A photo of inside of box prior to fitting ferrite beads on the coax between the Dongle and a bulkhead RF connector., in order to help reduce the likelihood of RF current loops between coax screen and chassis. I had to characterise suitable ferrites for the best VHF / UHF choking impedance, as most clip-on types or similar don't do anything at these frequencies. The USB screen needs a good low Z connection to the box metalwork and to the RF connector on the box. I found that if I didn't do this the screening was not as effective. Also any AC potential difference between the antenna coax and PC chassis resulted in current flow across the RTL PCB. This added multiple 50 / 100Hz noise sidebands to the LO. 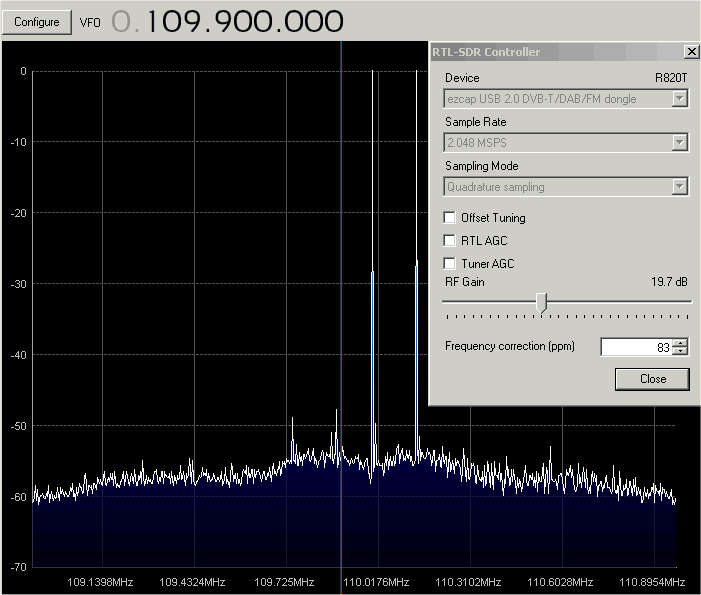 I've been experimenting with an HF up-convertor and RTL DVB-T RTL 2832U / Rafael Micro R820T. The Up-convertor consisted of a 50MHz input low pass filter, high level double balanced mixer, 100MHz Local Oscillator and Output filter. Total conversion loss was approximately 7dB plus an additional 10dB attenuator on the output to reduce the signal level going into the dongle. I tested the up-convertor and dongle with a variety of antennas, including a 10m vertical, two different active antennas and a 100ft doublet with ATU. 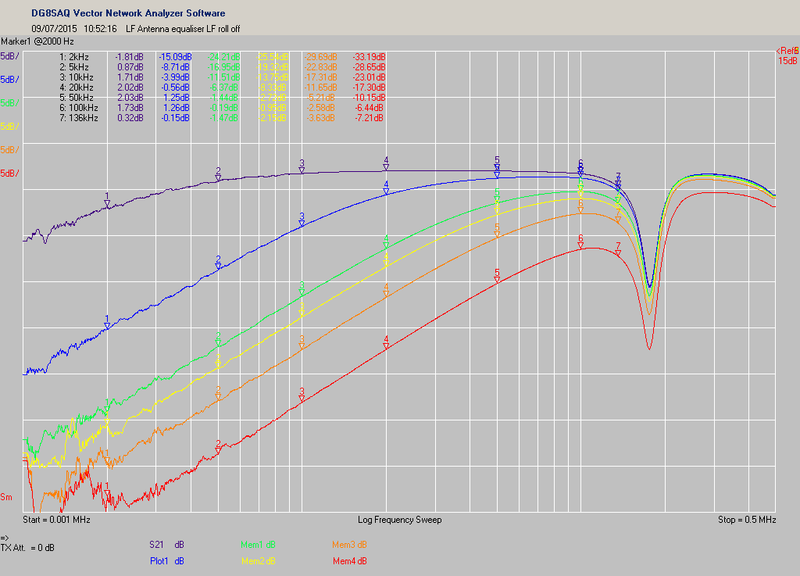 I measured the gain levels for different frequencies at which the dongle performed at the optimum performance in terms of S/N, dynamic range and low levels of IMD. I also made sure that there was enough headroom to cope with short duration increases in signal levels when operating at the optimum levels at different times of the day and night. I then averaged all the results and plotted them in Excel. The shape of the general gain / frequency curves tend to remain fairly consistent between day and night. The only real difference is that the overall gain has to be reduced by abut 10dB at night to prevent overload at some frequencies between 5 and 15MHz. My thoughts are to build up a 3 section band notch filter with a center frequency just low of the Up-convertor LO frequency, so that I can obtain the required 30dB slope characteristic and use the dongle and up-convertor without having to change the gain setting every time I move frequency. 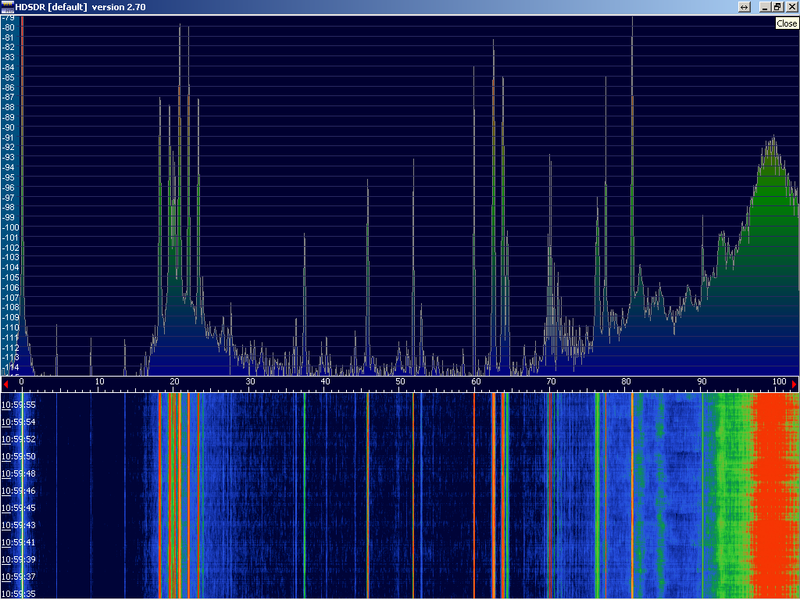 Heres a screen grab of the SDR Sharp spectrum display. 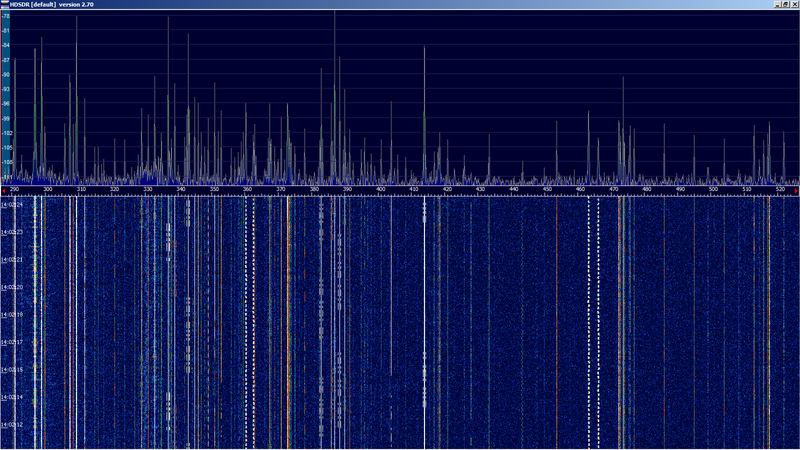 A pretty impressive number of stations I think  have you ever seen 10m so busy ? As part of this assessment I've also been testing to see if the limited dynamic range can provide adequate performance on the more crowded bands such as 7MHz. 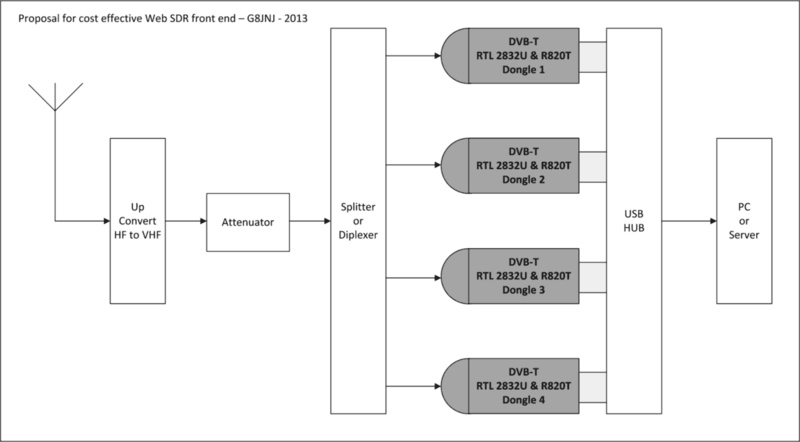 For these tests I have used a passive broadband vertical antenna in conjunction with an up-convertor and RTL820 dongle. 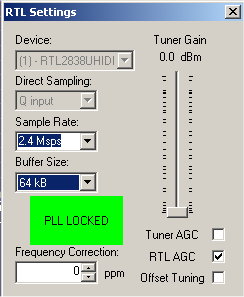 I used SDR Sharp with various gain settings but no AGC selected. In order to find a worst case scenario with very high level signals I chose frequencies near the 9MHz AM broadcast band. Notice the two diagonal traces from Ionospheric sounders gradually sweeping upwards in frequency. Here's another trace of the 7MHz amateur band with about 12dB of gain. No problems this time with intermodulation products, as the maximum signal levels are a lot lower than those from the AM broadcast stations on 9MHz. 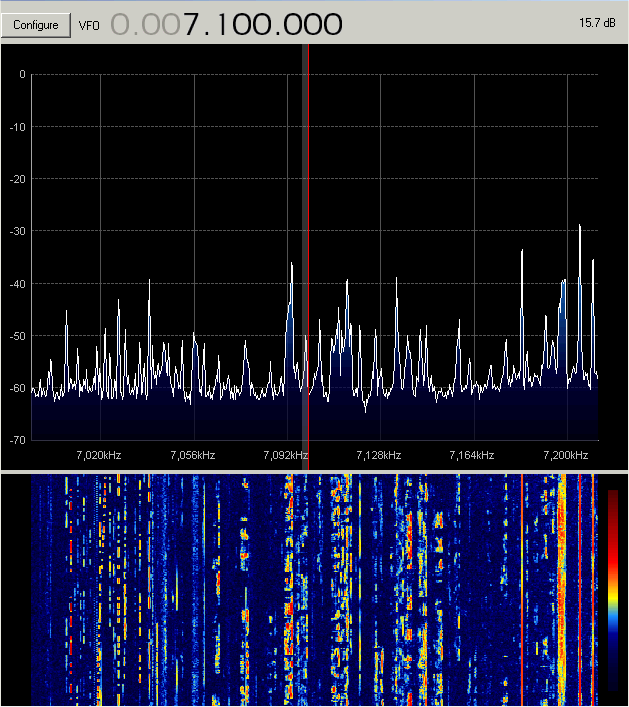 Just to prove that I wasn't cheating with the above screen grab, here's a wider view of the night-time spectrum, with high power broadcast stations either side of the 40m amateur band. I also attempted to perform some two tone IMD measurements on the RTL DVB-T RTL 2832U / Rafael Micro R820T dongle. However it should be noted that SDR's do not behave in the same way as conventional receivers with respect to the production of intermodulation products. Instead of distinctive single frequency products, the only observable products tend to be indicated by a rise in the noise floor, as the Analogue to Digital Convertors become overloaded and 'run out of bits'. The three screen grabs show in successive order. 1. 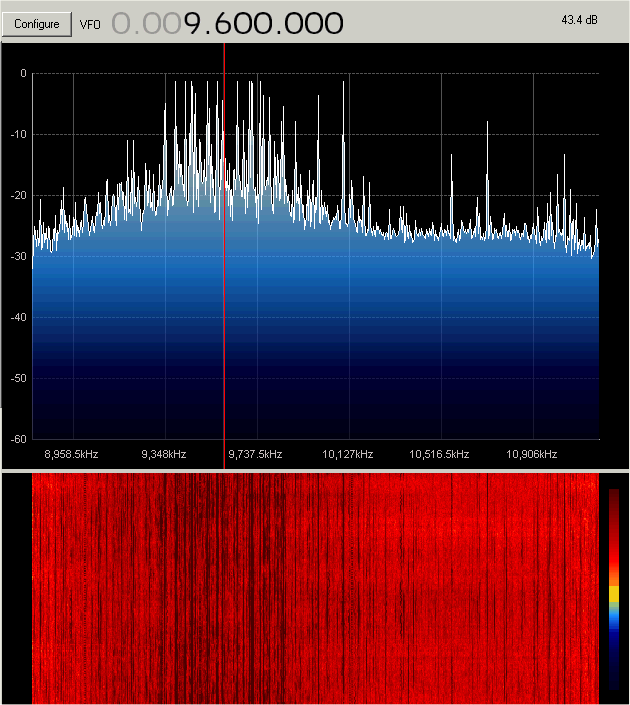 3rd order products with two carriers each at -3dB WRT 0dB reference line on SDR Sharp - note the relatively flat noise floor. 2. 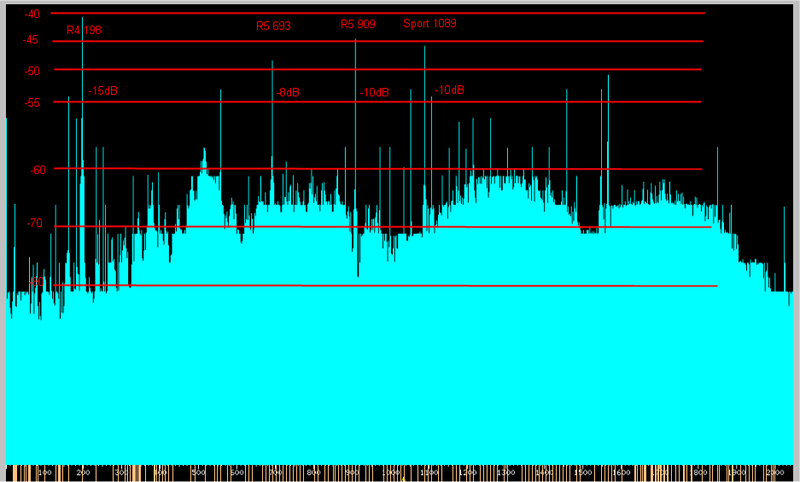 As 1 but at 10dB higher level - note how the noise floor is beginning to rise near the base of the two carrier signals. 2. 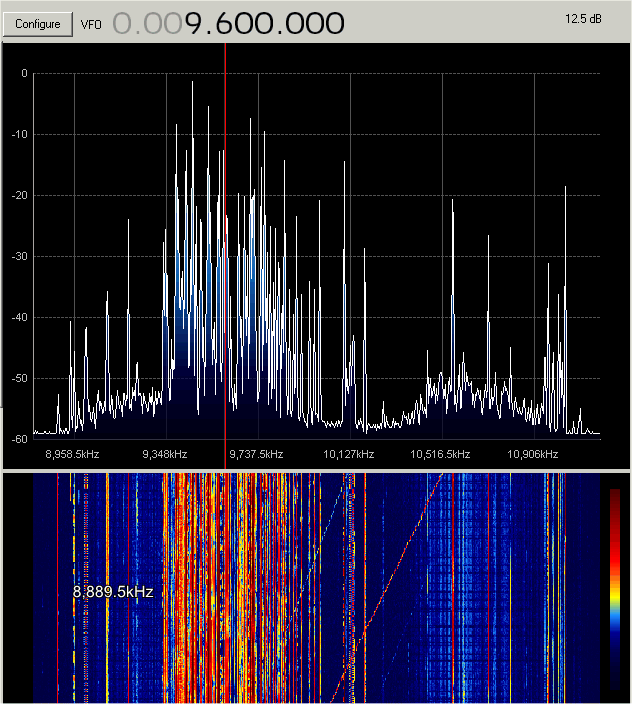 As 1 but at 20dB higher level - note how the noise floor is now quite high near the base of the two carrier signals and that other spurious signals are also being produced. I believe this demonstrates that if the SDR dongle gain is set appropriately, their performance is just about adequate for the reception of signals on the HF bands just using a simple block up-convertor. Note that in all of the above cases I was feeding the block up-convertor directly from a large broadband antenna with no additional filtering. 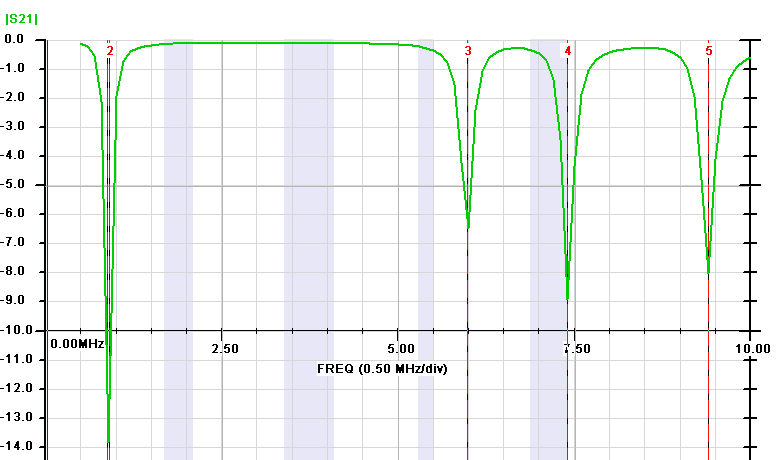 I have no doubt that the performance could be further improved by the addition of suitable band pass filters before the SDR dongle, if a greater dynamic range is desired on a particular band. Heres my suggestion of how to use multiple SDR dongles with a single HF up-convertor for a WEB SDR front end.